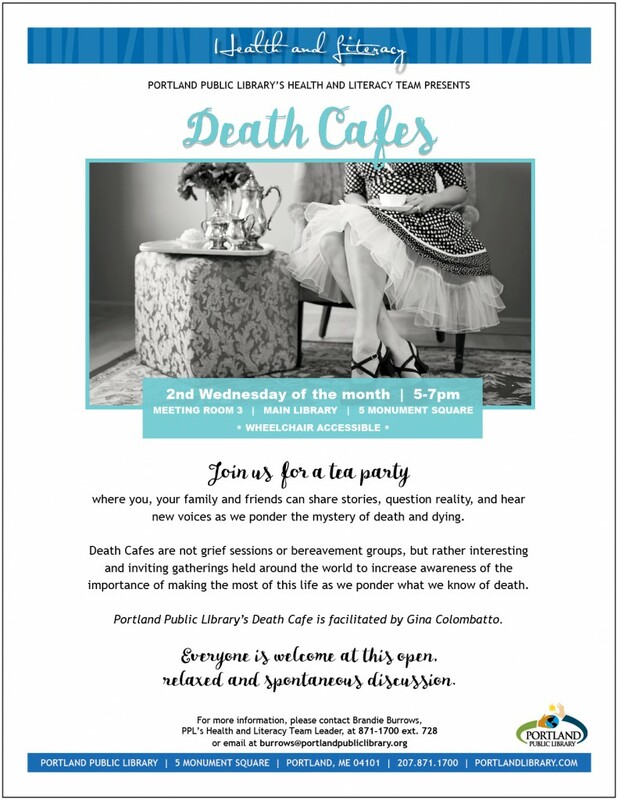 Please join us at the Portland Public Library for a tea party where you, your family and friends can share stories, question reality, and hear new voices as we ponder the mystery of death and dying. Everyone is welcome to this open, relaxed and spontaneous discussion held monthly on the 2nd Wednesday from 5:00-7:00PM at Portland Public Library in meeting room 3. This room is wheelchair accessible. Death Cafes are not grief sessions or bereavement groups, but rather interesting and inviting gatherings held around the world to increase awareness of the importance of making the most of this life as we ponder what we know of death. Begun by Jon Underwood in the UK, after being inspired by the work of Bernard Crettaz (and carried to the US by Lizzy Miles), Death Cafes are full of nourishing conversation, heartwarming reflections, and a plethora of questions about how we are all leaving this planet. Light refreshments will be served and provided by the host, Gina Colombatto, who continues to be intrigued by death, delighted in life, and is certain that we are all in this together. Having facilitated making life choices with teens, working through loss with hospice clients, and connecting people in joy-full community art projects, Gina embraces every opportunity to celebrate life and eat cake. She was the host of DeadDogDinah, a Mid-Maine community radio devoted to death conversations.